Add a little WOW! to your burger by topping it with your favorite Becki’s Olive Salsa! 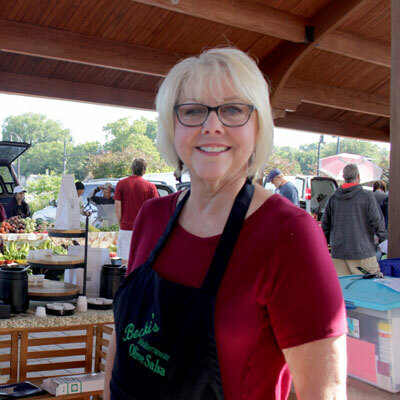 Or try Becki’s favorite, combining Original or Jalapeno Olive Salsa, with ground beef and grilled to perfection! 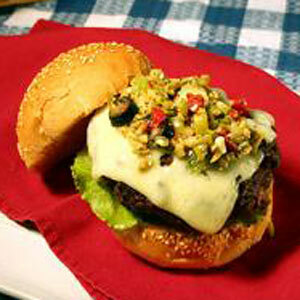 In a medium bowl, combine ground beef and Becki’s Mediterranean Olive Salsa; shape into 4 patties. To grill, spray grill rack with non-stick cooking spray. Using direct heat cooking method, preheat grill to HIGH. Grill patties, covered, to a minimum internal temperature of 160° (4-5 min./side) for medium doneness; season steak blend seasoning. Brush onion slices with olive oil; grill until softened (about 5 min. )., turning once. Toast buns, sliced side down, on grill rack until lightly browned (1-2 min.). Spread toasted surface of buns with Ranch or Bleu Cheese dressing; top with grilled burger, onion slice, and shredded lettuce.